"There's the pandit just in case...Shashi Kapoor and Rekha with Asrani in Chakker pe Chakker. Ashok Roy directs." 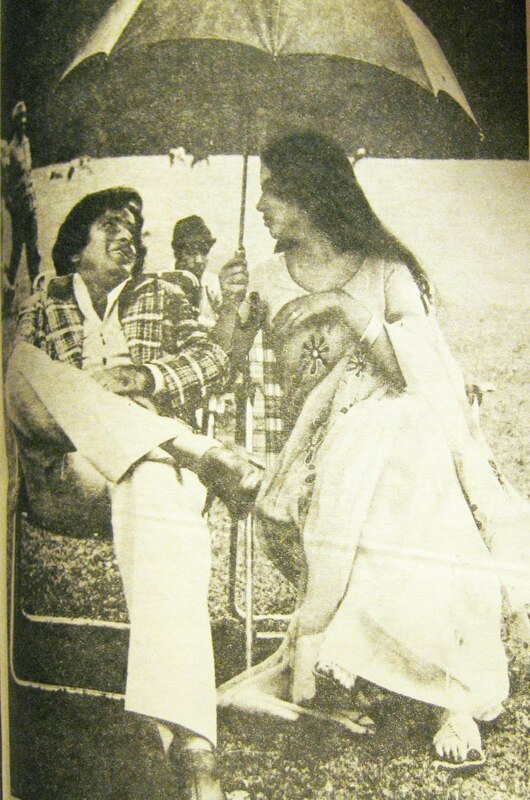 "Shashi Kapoor and Padma Khanna in Do Guru. Ravi Tandon directs." 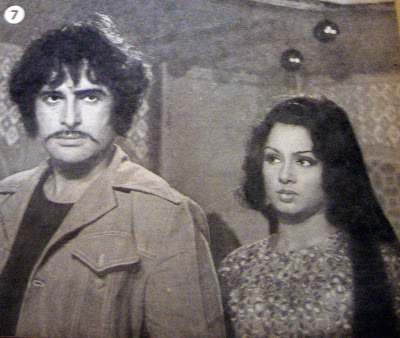 "Mahurat of Aahuti, from left: Zahirra, Parveen Babi, Shashi Kapoor, director Ashok V. Bhushan, Rajendra Kumar, Krishan Dhawan, and Rakesh Roshan." "Shashi Kapoor and Shabana Azmi location shooting in Gulmarg." 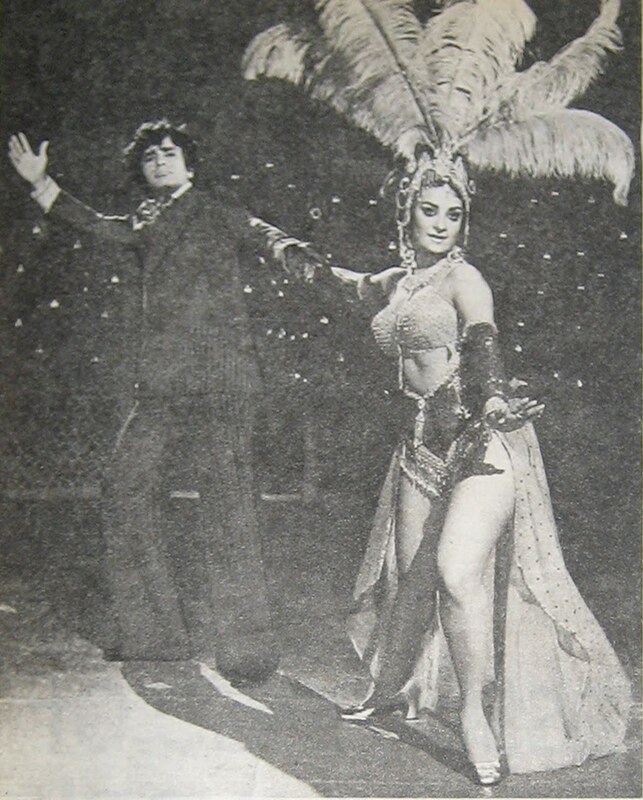 "Eagerly awaiting...Saira and Shashi Kapoor in Koi Jeeta Koi Haara." 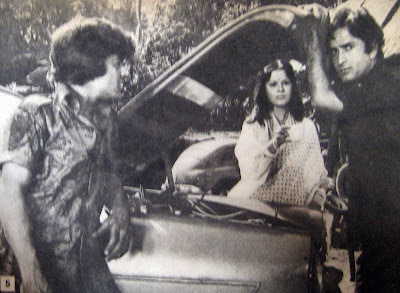 "Tea and sympathy and the petrol shortage...Shashi and Zeenat with Mehmood Jr. in Diwangi. Samir Ganguly directs." Cover image of the August 8, 1975 issue. 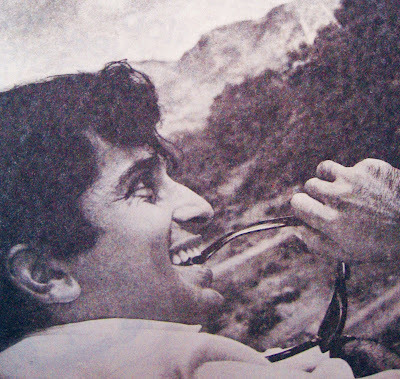 This one is from an article I will post next week from the issue above called "Shashi Kapoor: I'm Playing a Class C Stuntman." Photo: T. K. Arunachalam. All images courtesy of Filmfare. What is a Class C Stuntman and where can I get one those? Nom Nom Nom. Vah vah vah. Love the location shooting one w/ Shabana. So much pretty! Amrita - IKR? Those sound like they'd be a dime a dozen! PPCC - I love his SHOES in that one - well, that and how it makes me wonder if she has to hold the umbrella every time he sits down for a break. Zindabad two-inch heels for men! It was fun seeing all these old pics - takes me down memory lane! Do keep posting more from your filmfare treasure trove! "Eagerly awaiting...Saira and Shashi Kapoor in Koi Jeeta Koi Haara." Forty years later, I am still "eagerly waiting"! And there was "Do Guru", too? Did these films ever get a release? Welcome back from your Bolly break! 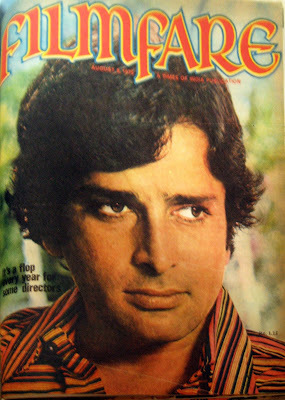 Shashi...swoon...give...more...weak knees.